Working on a Hy-Vee comercial with Celebrity Chef Curtis Stone in Kansas City, Mo. For those who have never used one, here is a brief description. 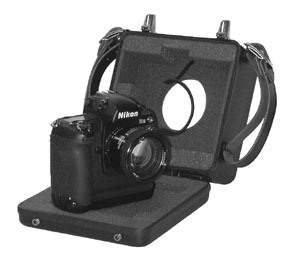 Sound blimps are specially designed for one of the pro cameras (Nikon D3 or Canon EOS 1D or 5D, etc). You open up the "box" by the 2 latches on top. You take the remote release cable inside the box and you attach it to the camera's remote port. You turn the camera on and set exposure. place the camera inside the foam and close the box. You then attach the lens through the round opening on the other side. The lens has a corresponding lens tube that fits snugly over the lens. 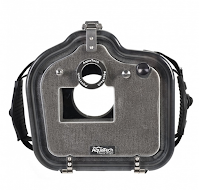 The end is covered by a glass filter, sealing the entire camera inside a bed of foam. The Jacobson had a few different release buttons on front so if you changed the camera settings, you could have the focus separate from the release. That is a very handy thing. It also has a 3/8 and 1/4 monopod threads on the bottom. You wouldn't want to try and handhold this all day. When you first see the Aquatech sound blimp, you are startled by its ergonomics. The Aquatech opens up with a single quick release clip on top and is made with polyurethane construction, stainless steel, aluminum, acrylic. It is lighter than the Jacobson, has more controls buttons and has a full acrylic back side. The lens tube foam gently holds the zoom ring, and you are able to move the zoom while it is encased. Handy, but I generally shoot loose and not zoom too much. 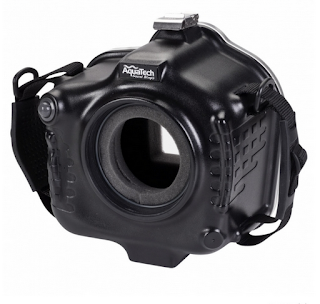 The immediate benefits of the Aquatech include the ability to review photos whenever you want, back button for the AE-L/SF-L and a dial that you can use to move Nikon's main command dial! Exposure can be adjusted! Wow! The extra controls on the back are really great. However, the shutter release button is a little hard to reach because of the girth of the blimp. Feels a lot different than a regular shutter release button. You need to get the feel of it. Of course, this blimp performs very well. Aquatech claims a 98% reduction in sound. I cannot dispute this. You can barely hear the shutter. The additional controls itself would make this the clear winner in my opinion. Photographers always want to chimp (review images). Photographers always want to be able to control exposure. Since the price for the Aquatech blimp body and tubes are nearly identical to the Jacobson ($1000/$350) the price is negligible. There is no savings to be had by going old school. The Jacobson is a fine device, but the Aquatech is the new king in town. Preston, for a theatrical setting, so you think the blimp is sufficient without a lens tube? How much difference does the lens tube make? Preston Mack is a professional photographer based in Orlando, Florida. His portraiture has appeared in publications such as People, Reader's Digest, Sports Illustrated, Forbes and ESPN The Magazine. He shoots for advertising agencies such as Yellow Shoes Creative, The Meyocks Group, Mullen, GSD&M, Carol H Williams Agency, PUSH and Fry Hammond Barr. His corporate clients include Walt Disney World, Southwest Airlines, Pillsbury, GM, Kraft, Hy-Vee, Tupperware and MLB Advanced Media. Buy the Nikon D4 or the D800? ©Preston Mack. Simple theme. Powered by Blogger.